This coffin clock is from the mid-century. It's made to look like wood. I love the font used on the numbers! 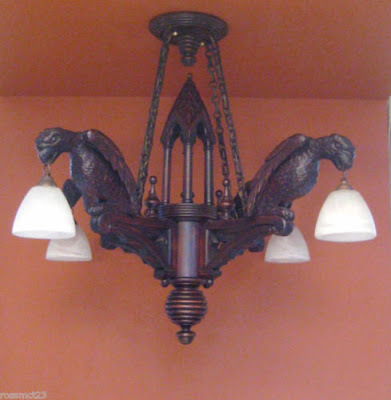 This supposedly is a gothic chandelier with ravens, but they look more like eagles to me? The devils look up at the North Wind on this antique thermometer. If your Bic or Zippo lighters are too modern for you, you could always carry around your matches in this antique figural devil match safe! To go along with it, here's an antique early 1800s coffin-shaped snuff box. This coffin-shaped 19th century reliquary is perfect for displaying a creepy doll or two. This "Bat Dancer" bronze sculpture is from the 1920s. She's not really all that batty or gothic, but I think she's so beautiful. These 1930s winged bat women bronzes are lovely too. I bet I'm not the only person swooning over these antique bat vases from the Meiji period (1860s-1910s Japan). Now when your vampiric suitor comes to call, they can leave their calling card on this antique bat card tray. If you're renovating your kitchen or bathroom, you can amp up your gothic style by incorporating this 1950s bat tile from Israel.